... I've been tagged! Val, my friend and fellow Sue Cummings CT member, tagged me with the challenge of creating a blue layout. Now for some this may have seemed a little daunting, but for me it was simple. 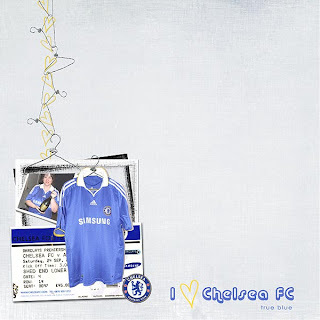 Straight away I knew what I wanted my LO theme to be ... a dedication to my beloved Blues ... aka Chelsea FC!!! Here you go Val, hope you like it! Thanks for the challenge. Great job on this challenge sue, you are a real FAN!